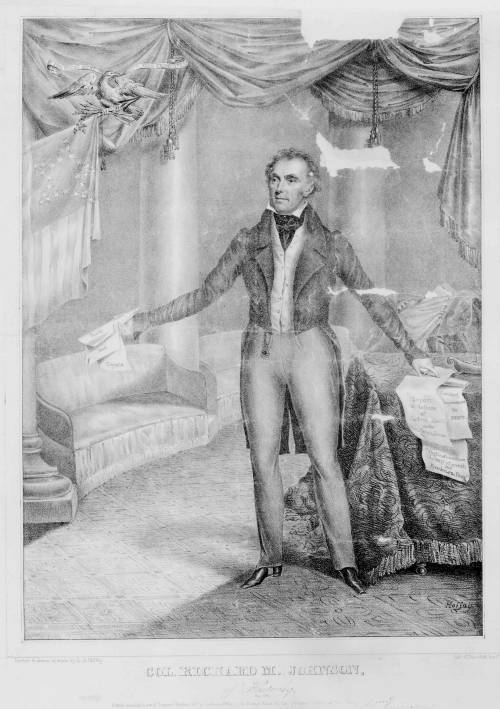 Portrait of Kentucky Representative Richard M. Johnson, standing in a rhetorical pose and holding documents inscribed "Sunday Mail Reports" in his right hand. He points with his left hand to other documents on a table which read, "Report in Defence of Andrew Jackson on the Seminole War", "Abolishing Imprisonment for Debt" and "Rights of Conscience, Liberty of Speech and Freedom of the Press". The print is the later and slightly larger of two versions of the portrait by Hoffay. (See no. 1833-2).